Thank you for your continued interest in Sony products. Sony is offering a firmware update for Digital 4K Video Camera FDR-AX1 and FDR-AX1E to version 4.00. Copying clips to USB external storage media. Displaying data codes while playing clips (for AVCHD format clips only). 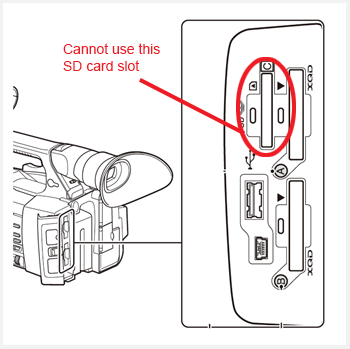 This camcorder cannot transfer the recorded data on the Memory Stick media/SD card by connecting the camcorder with the computer with an USB cable. Please use a memory card reader (sold separately). Free campaign editing software "Vegas Pro 12 Edit" can be used to edit the AVCHD clips recorded by this camcorder. Please check the version of the system software, following the procedure listed below. If the system software version is already Ver.4.00, you will not need the update. Switch ON the POWER of the camera. Go into the menu by pressing the “MENU” button. 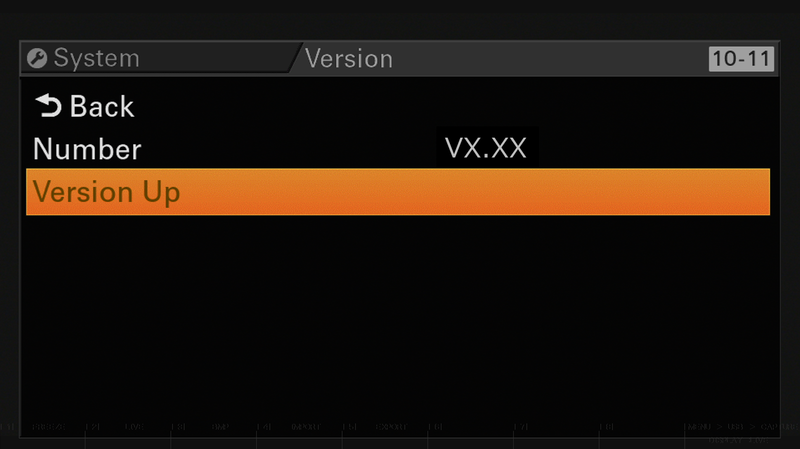 Go into “Version” in the “System” menu. System software version will be displayed. Press “MENU” button to exit the menu, after checking the version of the system software. Please prepare the following equipment other than the camera itself before downloading the update file. Please use a SDHC card (Speed Class: 4-10/UHS cannot be used/Capacity 2-32GB) or a SD card (File System: FAT16/Capacity: up to 2GB). 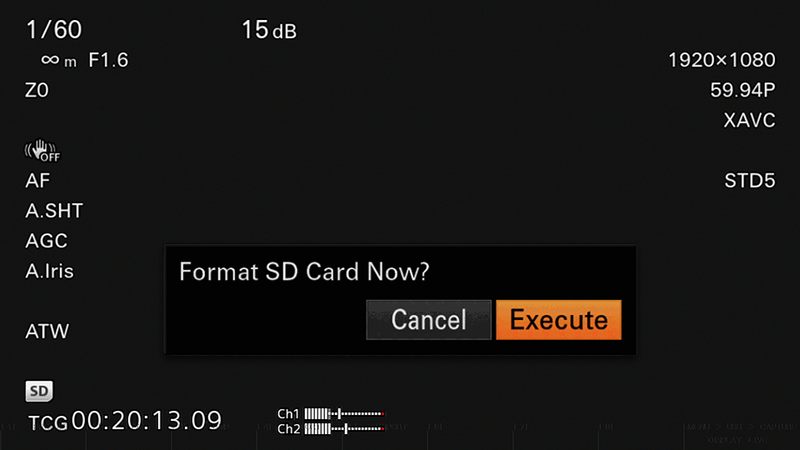 Format the SD/SDHC card using the PMW-Z100/FDR-AX1 and FDR-AX1E “FORMAT MEDIA” function. Please refer to the instruction manual regarding the “FORMAT MEDIA” function. 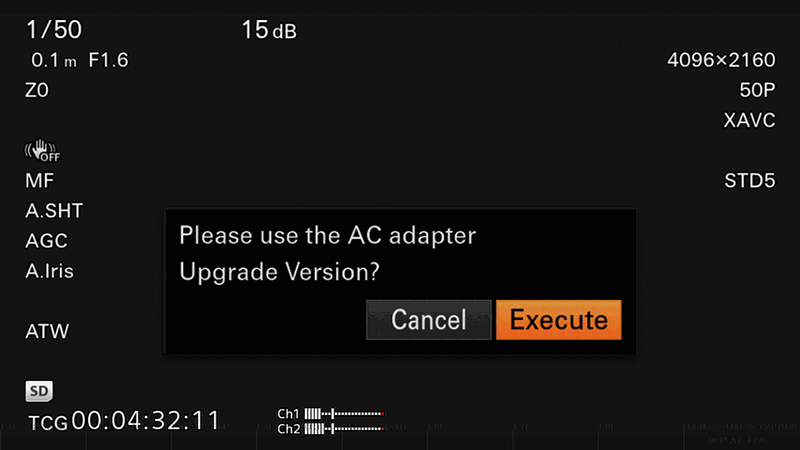 Please use the AC Adaptor(AC-NB12A) during the update. Download File: FDRAX1V400_firmware.zip (File size: 58.3MB (61,227,790 byte)). Depending on the OS, the downloaded file might all ready be uncompressed. Depending on your PC/Mac extension (*.bin) might not be visible. This file is a system software for the camera, you do not need to double click and open the file. 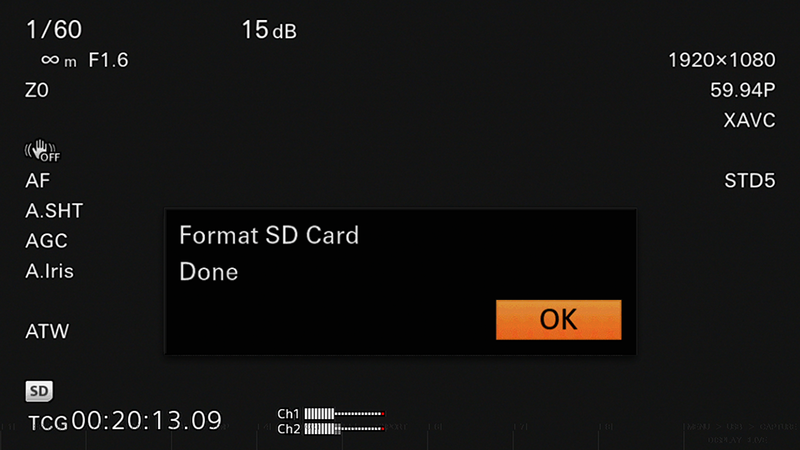 Prepare the media card (SD/SDHC) for the update by formatting the media card (SD/SDHC) using the camera. 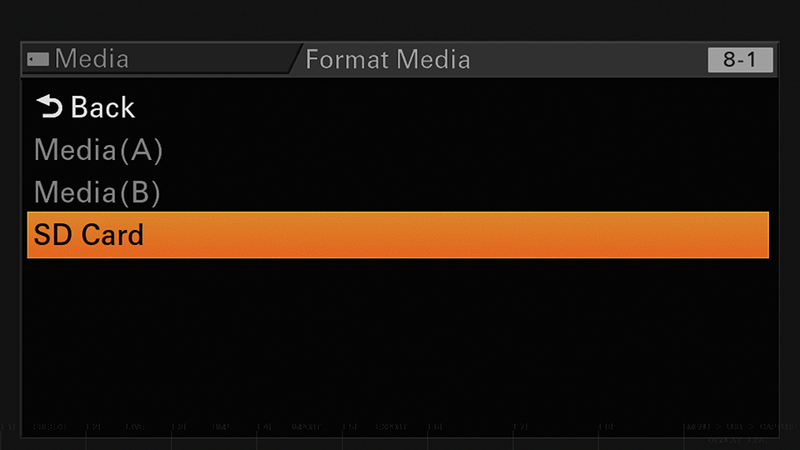 Prepare the media card (SD/SDHC) for the update. 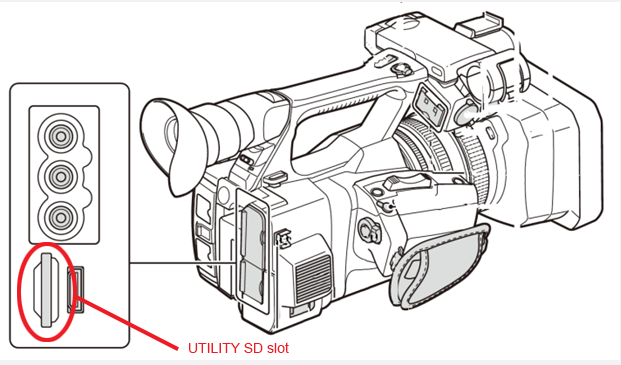 Format the media card (SD/SDHC) using the camera. 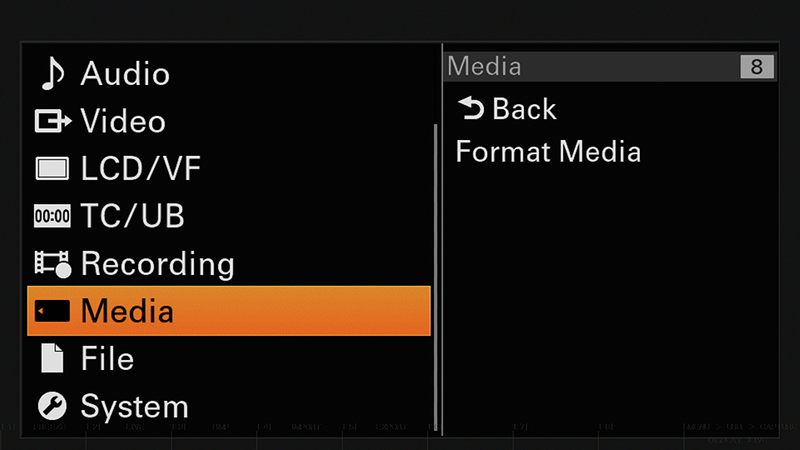 Update might not start, if the media is not correctly formatted. If you format the media, all files included in the media will be deleted. 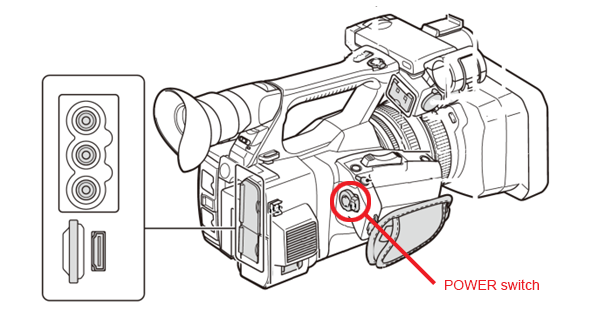 Insert the media into the UTILITY SD slot of the camera and turn the POWER ON. 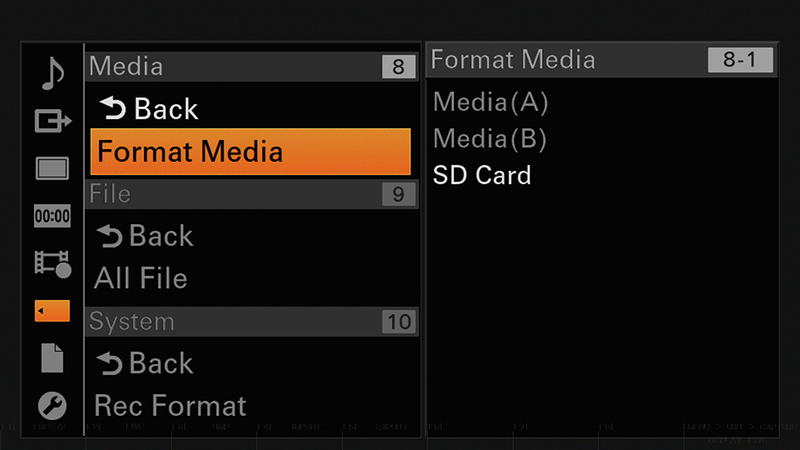 Go into MENU using the MENU button and select SD Card in the FORMAT MEDIA menu. Press SET and format the media. Press MENU button to close the menu after the format is completed. For updating the system software and formatting the SD card for the update, please use the UTILITY SD slot. Normal SD Card slot cannot be used. Remove the media card (SD / SDHC) from the camera after formatting the media, and insert it to your PC / Mac. Depending on your PC/Mac environment, execute one of the following procedure to copy the update system software file to the media card. When the media is inserted to a PC / Mac, several windows might pop up automatically, please close all of them. Copy the system software update file to the root directly (top layer) of the media. Please use the AC Adaptor (AC-NB12A) during the system software update. If the power of the camera turns off during the system software version update, the camera might not work properly. Please make sure the cable of the AC Adaptor does not detach. If the media card is ejected during the system software version update, the camera might not work properly. 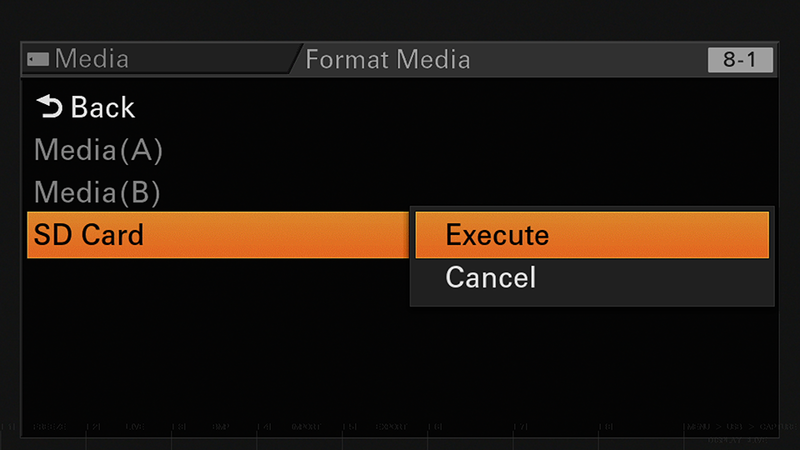 Please do not eject the media card during the system software version update. Disconnect connected devices(such as HDMI, microphone, LED light) and eject any media in the XQD memory card slot before upgrading. Insert the media card (SD/SDHC) for the system software version update, and turn the POWER ON by turning the POWER switch. 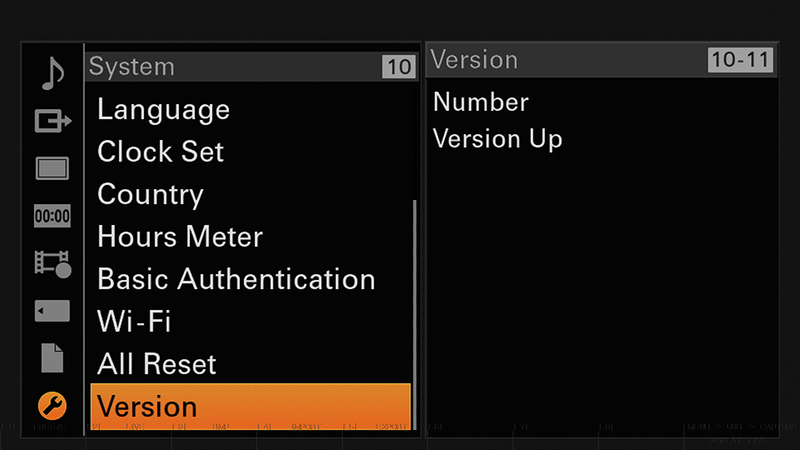 Go to Version in the System menu and select Version Up. Please use the AC Adapter; Upgrade Version? will appear on the screen. If the system software data is not found Version Upgrade No File will appear on the screen. Possible cause is listed below. system software update file is not saved on the root directly of the media (SD/SDHC). system software update file of an other camera has been saved. Could not decode the system software update data correctly. Go back to the first procedure and try again. 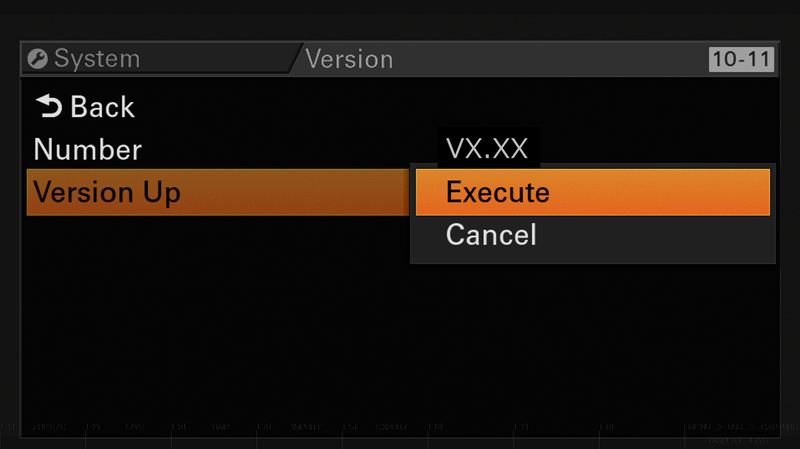 After select Execute, version update will begin. Version update will be executed in two phases, Phase 1 (Approx. 3 min.) and Phase 2 (Approx. 9 min.). 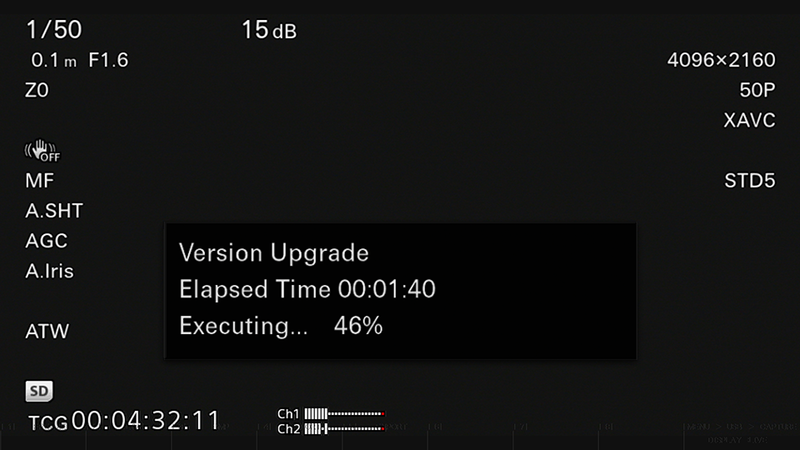 Between version update Phase1 and Phase2, the camera will reboot and the message on the screen will disappear. Although the message disappears from the screen, version update is still running, do not turn the power off. 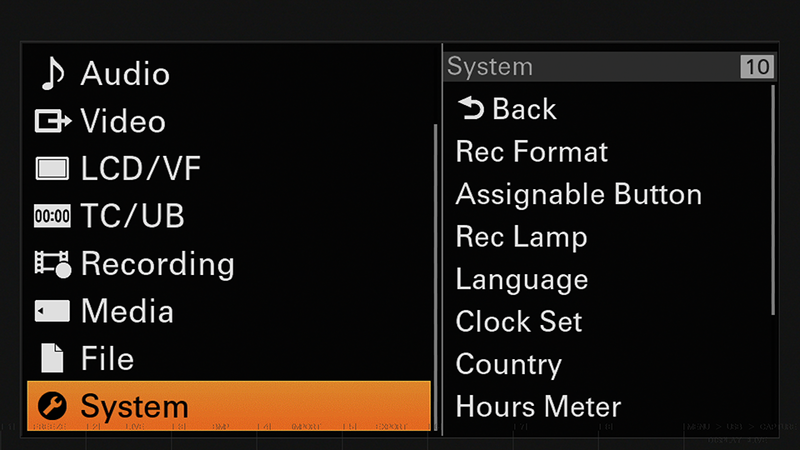 Once the version up is completed, the REC lamp will stop blinking and Version Upgrade OK Turn Power Off will appear on the screen. If there is a error during the version update, Version Upgrade NG: Cannot Read. Power Off will appear on the screen. Reboot the camera and redo the whole process from the beginning. 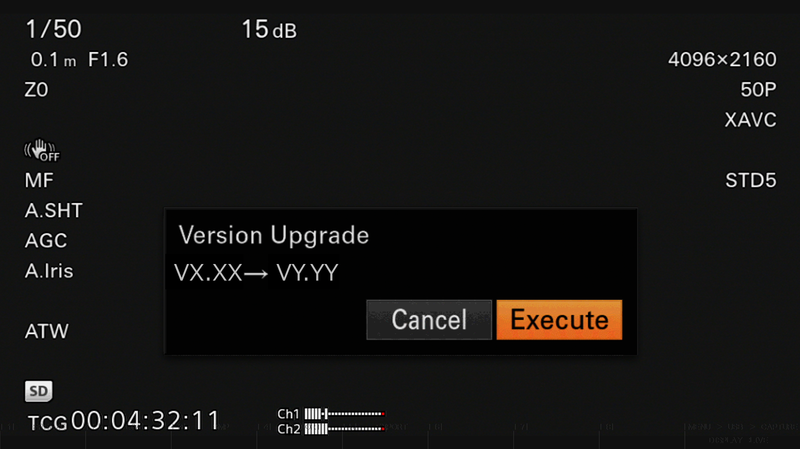 Version Upgrade Error!! will appear on the screen. Redo the whole process from the beginning. If the error still appears, camera might need repair, please contact your local Sony service center. Check the system software version. If the System software Version is not updated, please check the procedure and redo the version update again.